I know many of you wonder what we could possibly find to do on a remote island in Maine with a population of approximately 2,000 inhabitants. The answer is we are having an absolute blast. We have met some interesting and open hearted people and there are more things to do here than one would imagine. We have plenty of opportunities to bring something and I always bring something made of local produce (in this case apples). For instance tonight we were invited over to some new friends’ house for a pre-theater dinner and get together with others from the Sunshine area of Deer Isle. The Stegalls are an incredible couple and seem to be involved in almost every volunteer event. I thought there would be a total of three couples and was surprised to see that there were closer to 20 people. After we all went round robin introducing ourselves and where we lived, we lined up for a delicious repast. Lael had cooked two cauldrons of delightful homemade soups and there were delicious loaves of hearth baked bread that are available only on Fridays on the island. I saw cheeses and smoked salmon and any number of sweets. After eating dessert, we all rushed to the play – Brilliant Traces. Oh what fun this play was! So much energy and humor. 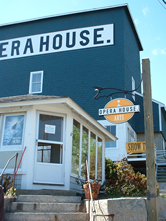 I love the fact the Stonington Opera House( http://www.operahousearts.org/index.php) is now open all year round. The opera house was originally built in 1839 as a dance hall and it has been through many renditions. It had been abandoned for several years before it was lovingly restored in 1999. We are fortunate to have this venue. There’s something going on every weekend. We attend movies, go to concerts and dances, and this live play was a real treat. All in all it was a perfect evening and I’m still smiling. Credit for the delectable cake recipe comes from my dear friend Sonia Grullon. 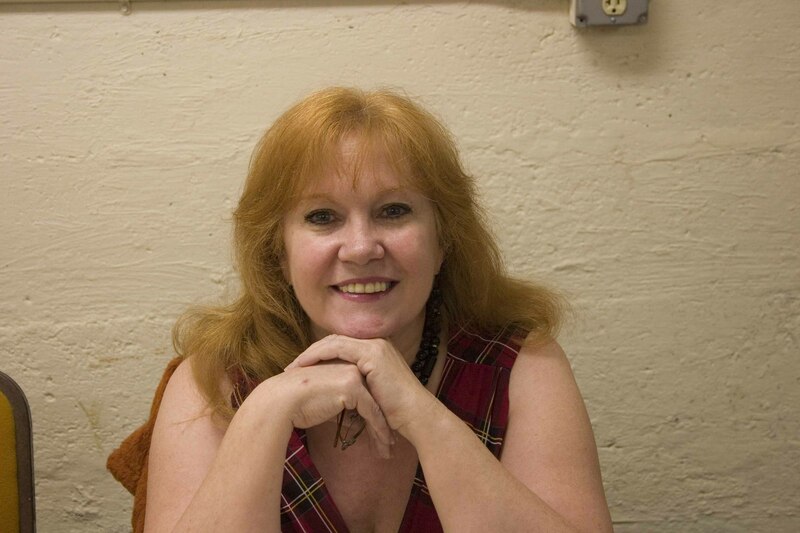 Sonia and I were neighbors in New Jersey. We became fast friends and “chosen sisters” raising our children and having dinner together almost every night. She has moved back to island of her birth, the Dominican Republic and yet we still speak with each other at least weekly. She’s opening up a bakery soon and I’m sure it will be a hit! I am a good cook but not a great baker. There are only two things I can bake that always turn out well – lemon bars and Sonia’s Infamous Apple Cake. Believe me, if I can do this then anyone can! Cream butter add sugar, then the 2 eggs one at the time. Cream well. Add flour sifted with baking powder. It is a stiff batter. On a 9 inches round spring mold, buttered and flowered, spread the cake batter. 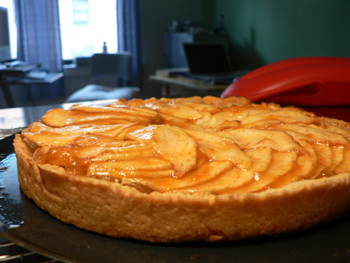 Place the apple wedges on top of batter, going around the perimeter then the center of mold. Push the apples a bit into the batter so they won’t “float”. Sprinkle with the brown sugar mixed with the cinnamon. While the cake is baking, cream butter sugar and eggs and reserve mixture. When cake is baked, reduce heat to 325 F , pull shelve out and add creamed frosting on top. Bake for an additional 15 to 20 minutes or until golden. This entry was posted in Community Relations, Recipes and tagged apple cake, baking, butter, cake recipe, Coastal Maine, community, cooking, deer isle, dessert, Downeast Maine, easy recipe, food recipe, homemade, living, recipe, recipe for, Stonington Opera House. Bookmark the permalink. 3 Responses to Let Them Eat Cake – Apple Cake! Looks scrumptious. Unfortunately, I am backing away from such delights right now, but will definitely make this if I’m ever asked to bring something somewhere. So I can get away with eating one piece instead of half of it. This recipe is always a crowd pleaser. It’s simple and delicious. But no, I could not eat it last night but it was almost as delicious to watch everyone else fall in love with it! I’m loving your blogs and am living on Deer Isle again vicariously through them. They are refreshing and bring back great memories for me. The apple cake looks scrumptious and I’ll add it to my “pot luck” repetoire. Always knew you’d integrate well on Deer Isle, Bravo!